OED on McJob: An unstimulating, low-paid job with few prospects, esp. one created by the expansion of the service sector. Coupland on McJob: A low-pay, low-prestige, low-dignity, low-benefit, no-future job in the service sector. Frequently considered a satisfying career choice by people who have never held one. 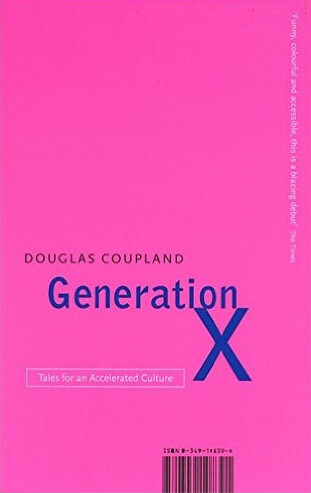 Below is a selection of entries from Coupland’s Generation X lexicon (Xicon? ), in the order they appear in the book. Some are obviously aimed at the era; others have more cross-generational application. If you haven’t read the book and are curious based on these snippets or on its reputation, I can recommend it. Emotional Ketchup Burst: The bottling up of opinions and emotions inside oneself so that they explosively burst forth all at once, shocking and confusing employers and friends – most of whom thought things were fine. Consensus Terrorism: The process that decides in-office attitudes and behavior. Power Mist: The tendency of hierarchies in office environments to be diffuse and preclude crisp articulation. Overboarding: Overcompensating for fears about the future by plunging headlong into a job or life-style seemingly unrelated to one’s previous interests; i.e., Amway sales, aerobics, the Republican Party, a career in law, cults, McJobs. . . .
Anti-Sabbatical: A job taken with the sole intention of staying only for a limited period of time (often one year). The intention is usually to raise enough funds to partake in another, more personally meaningful activity such as watercolor sketching in Crete or designing computer knit sweaters in Hong Kong. Employers are rarely informed of intentions. Bambification: The mental conversion of flesh-and-blood living creatures into cartoon creatures possessing bourgeois Judeo-Christian attitudes and morals. Diseases for Kisses (Hyperkarma): A deeply rooted belief that punishment will somehow always be far greater than the crime: ozone holes for littering. Spectacularism: A fascination with extreme situations. Cult of Aloneness: The need for autonomy at all costs, usually at the expense of long-term relationships. Often brought about by overly high expectations of others. Celebrity Schadenfreude: Lurid thrills derived from talking about celebrity deaths. Personal Tabu: A small rule for living, bordering on a superstition, that allows one to cope with everyday life in the absence of cultural or religious dictums. Rebellion Postponement: The tendency in one’s youth to avoid traditionally youthful activities and artistic experiences in order to obtain serious career experience. Sometimes results in the mourning for lost youth at about age thirty, followed by silly haircuts and expensive joke-inducing wardrobes. Conspicuous Minimalism: A life-style tactic similar to Status Substitution. The nonownership of material goods flaunted as a token of moral and intellectual superiority. Café Minimalism: To espouse a philosophy of minimalism without actually putting into practice any of its tenets. Squirming: Discomfort inflicted upon young people by old people who see no irony in their gestures. Karen died a thousand deaths as her father made a big show of tasting a recently manufactured bottle of wine before allowing it to be poured as the family sat in Steak Hut. Conversational slumming: The self-conscious enjoyment of a given conversation precisely for its lack of intellectual rigor. Occupational Slumming: Taking a job beneath one’s skills or education level as a means of retreat from adult responsibilities and/or avoiding possible failure in one’s true occupation. Me-ism: A search by an individual, in the absence of training in traditional religious tenets, to formulate a personally tailored religion by himself. Most frequently a mishmash of reincarnation, personal dialogue with a nebulously defined god figure, naturalism, and karmic eye-for-eye attitudes. Strangelove Reproduction: Having children to make up for the fact that one no longer believes in the future. Derision Preemption: A life-style tactic; the refusal to go out on any sort of emotional limb so as to avoid mockery from peers. Metaphasia: An inability to perceive metaphor. Obscurism: The practice of peppering daily life with obscure references (forgotten films, dead TV stars, unpopular book, defunct countries, etc.) as a subliminal means of showcasing both one’s education and one’s wish to disassociate from the world of mass culture. Expatriate Solipsism: When arriving in a foreign travel destination one had hoped was undiscovered, only to find many people just like oneself; the peeved refusal to talk to said people because they had ruined one’s elitist travel fantasy. Coupland’s book has many more. This entry was posted on Saturday, July 2nd, 2016 at 12:25 pm and is filed under books, humour, language, phrases, slang, words, writing. You can follow any responses to this entry through the RSS 2.0 feed. You can leave a response, or trackback from your own site. I can relate to some of them too, Gitanjali! Option Paralysis, for example, and (in my 20s) a bit of Expatriate Solipsism. Enjoy the book. Er, thanks. Modified rapture perhaps. I am certainly guilty of attempted Obscurism, but I only did it to tease, and anyway it usually turned out that they knew far more about it than I did. Does being pleased with them afterwards make up for Strangelove reproduction ? Pleased with the offspring? I don’t think it bears upon it. But there may be room for a related term meaning ‘pleased with one’s children despite their issuing from Strangelove Reproduction’ – maybe Suspended Salvation?